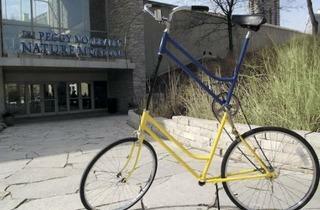 The Nature Museum pedals bikes as eco-friendly and fun. “We don’t have to work very hard to get that point across,” adds Alvaro Ramos, vice president of exhibitions and the museum experience. He admits, though, that organizers had two ulterior motives for wheeling out these metal steeds. That’s where the exhibit, which opens March 31 and runs through September 9, will really connect with families, who Ramos says are the primary target market. He and his core team of four Nature Museum staffers, who’ve been developing the exhibit since last summer, are driving the fun home by getting local kids involved. That’s why they reached out to a few of the city’s prominent bicycle-advocacy organizations that work with young enthusiasts. West Town Bikes NFP, based in Humboldt Park, and Blackstone Bicycle Works in Woodlawn do much more than keep mechanics busy. These nonprofits also run programs connecting underserved youth with bikes while providing job skills and experience to teens. In a section of the exhibit dubbed the Wheel People Bike Shop, kids can learn how to be mechanics, practicing on customized wooden bikes—sometimes led by peers from these groups. Another component of the exhibit focuses on cycling artifacts. While some kids might find history boring, Ramos and his team are betting that history on wheels is another matter. But it would be silly to have an entire exhibit devoted to bicycles without providing a chance to ride. As the weather warms up, Ramos says, “We’re going to have a lot of tie-in programs, including bike tours that originate at the museum,” which is conveniently located right near the lakefront bike path. Again, the Nature Museum has invited the outside bike agencies to plug in. For an Earth Day celebration, West Town’s Wilson says they’re arranging a bike rodeo. “We’re planning a safety course geared toward younger elementary-school students, overseen by our high-school students.” Later, for the museum’s summer-solstice celebration, West Town will organize and lead a family-oriented community bike ride through Lincoln Park. The exact route isn’t planned yet, but it will be short enough to accommodate families with young kids. “Bikes! 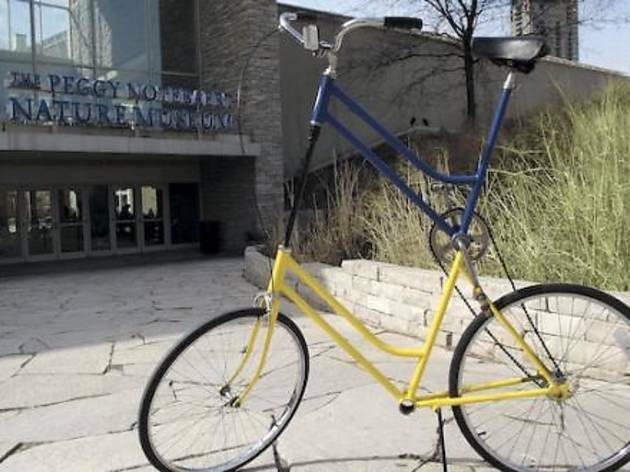 The Green Revolution” keeps pedaling all summer long, through September 9, at the Peggy Notebaert Nature Museum. To learn more about programs at West Town Bikes, visit westtownbikes.org; for Blackstone Bicycle Works, read more here.